So, you’ve got your ticket and travel package for Super Bowl 50 in sunny San Francisco, California. And as exciting as game day will be, you want more. We want to be sure this unique opportunity of experiencing the bay area during Super Bowl weekend is one you will never forget! 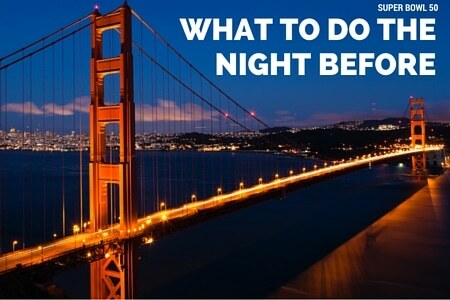 Here are five things you and your crew can do in the hours leading up to Super Bowl Sunday. Starting with Super Bowl XLVI in Indianapolis, the host city’s planning committee has always taken over a designated street for a fan village of sorts. This year, Super Bowl 50’s “Super Bowl City” in San Francisco’s Justin Herman Plaza downtown, is no different. The big-city block party, which will run for an extra weekend this year, will begin on January 30 and run all the way through Super Bowl Sunday, February 7. There will be cultural performances and food unique to the bay area’s certain style. Not to mention, Super Bowl City will be home to CBS Television Network’s broadcasts all week as well as ESPN, which is almost guaranteed to bring celebrities, players and many more. This family-friendly (and FREE!) event is a must-visit, possibly even more than once. The atmosphere, combined with the uniqueness of San Francisco, bring Super Bowl City to life and make it an unforgettable memory made with friends and family. The NFL Experience (NFLX) is also in its fourth year of production. Dubbed “pro football’s indoor interactive theme park,” the NFLX is a great place for anyone, no matter your age. Compete in interactive games such as an NFL field goal kicking contests or passing competitions. Watch as the NFL Network broadcasts NFL Total Access and news updates. Take part in the opportunity to meet some of your favorite players, both present and past. And go through the NFL’s champions exhibit, showcasing Super Bowl rings, a replica Lomardi Trophy, jerseys and momentos from past Super Bowls and much more. CBS Radio will be bringing their third annual “The Night Before” concert event, a pre-Super Bowl 50 kickoff concert, hosted at San Francisco’s AT&T Park. Headlining the concert will be popular rock band and bay area-oriented Metallica, who has made a habit of playing concerts at AT&T Park. The band will also be joined by the popular band Cage the Elephant. Most people wouldn’t think about attending an NBA game during the NFL’s big weekend. But why not pack as many sports into one weekend as possible? The Stephen Curry and the NBA’s best team and defending world champions take the court that Saturday, February 6 against the explosive duo of Russell Westbrook and Kevin Durant as the Golden State Warriors face off against the Oklahoma City Thunder. Visit one of the most electric arenas in the NBA and connect with one of the world’s greatest fan bases. After a full day of sports, competitions and concerts, you’re bound to be hungry. So head on over to San Francisco’s House of Prime Rib, voted #3 in Zagat’s Top 20 Restaurants in the bay area, for a good, hearty meal. The House of Prime Rib offers as much prime rib as one could ask for, carved directly in front of you at your table. Fresh salads are also spun in a mixing bowl at your service. Just two of the premium services this top tier dining restaurant offers. Prime rib is all you can eat, and their lists of wines and cocktails is as long as a football field. So what are you waiting for? Interested in all of the activities above, but haven’t booked your Super bowl 50 travel package yet? Time to take action! Inquire about a Super Bowl 50 travel package of your own today!